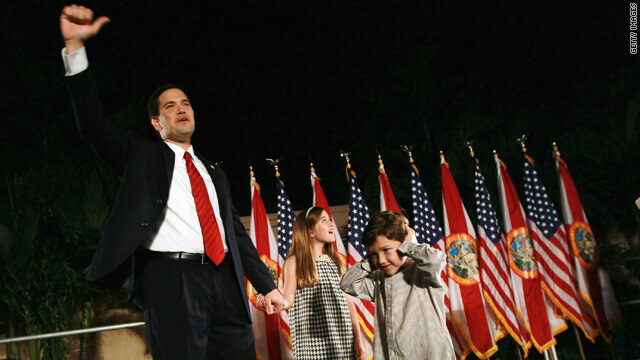 Tea Party favorite Marco Rubio celebrates winning a U.S. Senate seat in Coral Gables, Florida, on Tuesday. (CNN) -- Americans are waking up to smell the coffee. Turns out it's tea. The Tea Party was transformed from a potentially forgettable protest movement into an established political fact in this week's Congressional election, putting at least five of its candidates into the Senate and more than twice as many into the House of Representatives. "I can't remember a time when a group of people have come out of nowhere and elected so many people so quickly," said former white house aide David Gergen, now a CNN analyst. "Extraordinary." The election was a bitterly fought contest to choose lawmakers in Washington and leaders of state governments nationwide. It was dominated by angry debate about the Obama administration's management of America's economy and public finances. Voters ended Democratic Party control of the House of Representatives and reduced the Democrats to a slim and nearly marginal majority in the Senate. The Republicans were the beneficiaries, thanks in large part to the boost they received from the Tea Party. A party in name only, it began two years ago as an informal movement railing against high taxes and government spending. It takes its name and inspiration from the Boston Tea Party, an 18th-century uprising against tea taxes that helped set-off the American Revolution. Today's Tea Party is a hard-to-categorize hybrid. It draws much of its support from Republicans and its leading figures run for office as Republicans. But it has also forced some prominent Republican figures from office for being too close to the president or too ready to tax and spend. They Democrats are going to have to share power with the Republicans. The Republicans are going to have to share power with the Tea Party. Together they face big problems. You now what they say: wake up and smell it.